14 Top Book Editors in Washington, D.C.
Book editors take your story and care for it as if it were their own. They are not only incredibly passionate about the publishing industry, but also dabble in different subject matter so as to mould your writing into the most accurate and interesting read. You may be mind-boggled by the different kinds of editing available. To clarify, developmental or substantive editing is the process where the coherence of the entire volume is analysed; this includes plot points, chapter organization, logic etc. The entire text is minutely filtered to cut off parts that aren’t needed. Copyediting is the correction of grammar, word usage, writing style and so on. Proofreading involves minor editing concerning spellings, punctuations and is usually done at the last stage. Here’s a list of 14 top book editors in Washington D.C. who are familiar with not only fiction genres but several academic topics like health, sustainable development, policy formation etc. Be sure to go through their website properly before you contact them. Founded in 1996 by Dale Adams, the company was first called Editorial Services Online and then became Wordfirm Inc. The department of Wordfirm Inc. that provides editorial services is now called Managed Editing. It is located in New Hampshire Ave of Northwest Washington D.C. The editors employed at Managed Editing have been working on all sorts of content for government agencies, NGOs, publishers and other clients. The services they provide are developmental editing, proofreading and copyediting. As for their charges, you need to provide some basic information about your manuscript, so that they can get back to you with a quote. In order to get in touch with the company, you could ring them up, send an email or fill in the form on their contact page. The Word Process is the brainchild of two authors, Molly McKitterick and Linda Cashdan. As authors, the duo realized the importance of editing and planned to utilise their knowledge of developmental editing to assist other writers. Having been established in the year 1997, The Word Process has run a good 20 years and continues to provide editing services to many clients. A look at their clients’ gallery will show you the broad range of titles they’ve worked with. They offer nonfiction editing, novel editing and developmental editing. The focus points of each of these services are available on their website. They are the complete package because they are well versed in editing all genres of fiction, including mainstream fiction, erotica, horror and magical realism. They’ve also had the chance of editing several nonfiction genres like memoirs, guides, fitness, diet, medical books etc. The duo was later joined by Nancy Beardsley, as an Associate Editor, who does proofreading, general critiquing and so on. You will find this organization in Northwest Washington D.C. Once you contact them through phone or by filling out the form on their website, they can get back to you with information on their per hour rate. Looking for editing services tailored to your needs? Look no further, because Chad B. Anderson is capable of handling your manuscript in whichever way you require; be it fact checking, proofreading, developmental editing, manuscript critiquing or copy editing. He charges $90 per hour for critiquing and developmental editing. For the other three services, his rates are $80 per hour. He has previously worked on creative and academic texts such as fiction, nonfiction and literary titles. With an MFA in Creative Writing from Indiana University, Chad has not only been a freelance writer and editor, he also taught literary editing and publishing at Indiana University. He has been a freelance editor since 2008. You could request a service by sending him an email or submitting information about your manuscript. An author, editor, journalist and speaker, Amy Abrams is based in Washington D.C. In addition to editing, she provides a great many services like ghostwriting, marketing, PR, coaching etc. She has been working on books, literary journals, magazines and web content since 2002. George Washington University is one of her many clients. Her novel released in 2013, “Schenck in the 21st Century: The Myth of the Hero and the Truth of America” has won the U.S Literary Award for Fine Arts. If you have a fiction, memoir or other nonfiction manuscript that needs editing or proofreading, you should reach out to her through her website or via LinkedIn. Editing Unltd. has been in business since 1988, when Marta Steele decided to put her vast talents into use, helping writers bring out the best in their text. She is available for proofreading, copyediting, line editing and indexing. The subject matters previously dealt with by Marta are history, popular fiction, classics, sociology, art, business and more. She has several clients in the Washington D.C. and New York areas. You can send a message to this language expert by filling a form on her website or through LinkedIn. In 2014, Darrell and Katie Neely established Neely Worldwide Publishing in Washington D.C. The Neely Productions Inc. is the facet of the publishing house that provides editing and book publishing solutions for its customers. So now you can have your book minted into shape by Neely Productions Inc. and then possibly have it published by Neely Worldwide Publishing. They provide a whole slew of services such as proofreading, editing and manuscript appraisal. The basic editing and proofreading package starts from $250 and goes beyond $895 depending on your manuscript word count. For the advanced package, you’ll have to pay a minimum of $500 and anything till $1090 if your manuscript is 90K words long. They represent many genres in fiction and nonfiction as well as children’s books, poetry, anthologies etc. You should contact them via the form on their site at the earliest to get the right quote and understand the editing procedure. You can also get in touch with Darrell and Katie via LinkedIn. Sebold Communications places its focus and efforts on health, environment and arts relevant texts. They have tons of experience editing academic books, brochures and the likes. They offer editing, writing and research services. A company set up by Mary Sebold in the year 2004, you can choose whether to sign up for proofreading, substantive editing or copyediting. With a mastery of Arabic, French and Roman, Mary is also available for translating your texts, if need be. Contact her via LinkedIn or her website in order to find out her charges for editing your manuscript. Aphrodite Knoop pays great attention to projects so as to shape her client’s story in an impactful manner. She is a freelance writer and editor based in Washington D.C. Her work caters to the engineering, construction, architecture and sustainable development fields. She has provided various editorial services for different publishers and organizations and is capable of writing eBooks as well. You can contact her via email or phone to better explain your manuscript and possibly get a quote from her. Global Grants Solutions, an organization in Washington, D.C., is keen on providing appropriate writing and editorial services in order to fulfil your content requirement. David Lindeman is the Principal of Global Grant Solutions with years of experience editing proposals, book chapters and websites. He has a Certificate in Copyediting from the University of California, San Diego. His client list usually includes authors, NGOs, business professionals and publishers. For light, medium or heavy copyediting, fact checking and proofreading, you can connect with them via their website, email or phone. Writers in the D.C. area can benefit from the services provided by Open Boat Editing. It was started by an English and Creative Writing graduate of George Washington University, Evelyn Duffy, in the year 2006. She has played an integral role as a researcher and editor in Bob Woodward’s New York Times Bestsellers. The editorial services you can avail are that of fact checking, proofreading, line & content editing etc. She welcomes indie authors who have just begun their writing careers. Fiction, nonfiction and academic works are open for discussion as long as you read the guidelines and submit relevant information. With regards to nonfiction, Evelyn has an inclination for narrative nonfiction about science, politics, current affairs and history. You can contact her through her website or by sending in an email. Christina Lyons, a Communications graduate from University of Pacific in California, is a freelance editor and writer living in Washington D.C. Since 2009, she has been providing editing services for lifestyle and political content, for both print and online media. You can request copyediting or rewriting of your manuscript by filling this form on her website. Her experience of teaching, researching and working closely with teen writers allows her to understand the targeted audience of a text. She coaches editors in different techniques of refining content. Take a look at her LinkedIn profile to better understand her skills and experience. When you take your manuscript to a professional who has been in the business for over two decades, you can’t possibly go wrong. Herta B. Feely established Chrysalis Editorial after years of being an editor. The company that took root in 2006 in the Washington D.C market provides all sorts of editorial services like line editing, developmental editing, proofreading, copyediting etc. Herta has worked on memoirs and full-length fiction novels. Emily Williamson also offers her services as a Senior Editor at Chrysalis Editorial. She has assisted authors with regards to short stories, essays and novels. If you’re manuscript falls in the category of commercial fiction, literary fiction or YA, you should get in touch with Emily. You can contact them via email or Facebook. All the details you need are on their website. With an M.A in Classics from University of Arizona, Brent A. Hill set up Lyceum Editing as a freelance editor. It is located in the Washington D.C. metro area and has been functioning since 2008. Brent A. Hill kickstarted his editing career when he trained with American Geophysical Union as a copyeditor. His expertise lies in the science, technical and other academic fields. You should contact him to discuss the possibility of him taking up your manuscript; this would also enable him to determine his rate per project. He is available on multiple platforms like Facebook, Twitter, LinkedIn, as well as by phone or email. The services he provides are that of proofreading, substantive editing, copyediting and developmental editing. If you don’t know what kind of editing you’re looking for, consult him and you’ll be able to make a decision. Dara Kaye has been working as a freelance editor as well as an employed editor at a literary agency in Washington D.C. The services she provides are copy editing, developmental editing, editorial assessment and proofreading. She graduated with an M.A in English Literature and has experience working on both fiction and nonfiction texts. Genres previously tackled include Politics & Current Affairs, YA & Teens, Fantasy, Economics, Literature, Women’s Fiction, Memoirs etc. Dara Key Editorial was started in 2011. Take a look at her selected portfolio here. You can get a quote for your manuscript after you fill in all the information regarding your book. Once that’s been dealt with, contact her via Twitter, email or Reedsy. It takes the eye of another to unearth the beauty in your text. All of these editors in Washington D.C. have done the rounds of the publishing industry and will take over your manuscript with meticulous attention. It is upto you to take the initiative. Dig up the book you had written years before, dust it and send it to an editor, once you’ve come to an agreement with them. Before you know it, you’ll have publishable material in your hands. 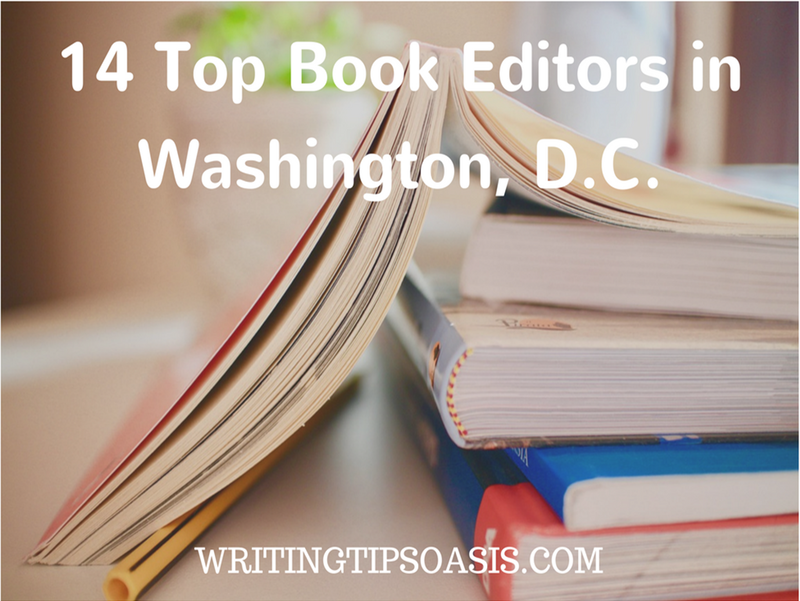 14 Top Book Editors in Washington, D.C. is an article from Writing Tips Oasis.